I had been to Hosahalli last week and Kumar, the headmaster took me around the campus to show me the latest developments. He took me to the place which was the school dairy earlier and told me that it had now been converted to a hostel and guest rooms. Seeing the erstwhile dairy evoked a lot of memories in me. The school was just getting established in the early 90s and the tribal children had started showing interest in it. The numbers were steadily rising – from 28 in 1988 to around 100 by 1992. These children never had milk or milk products in their daily diet and found accepting milk or curds difficult. Gradually, due to the nutritional necessity, we had introduced both and the children had started accepting them. Procuring milk for these children was a real challenge and we had to depend on milk powder for our needs. But we felt that this would not work and started exploring different options. This was the time that Swami Bargeshanandaji suggested that we rear cows to address our milk needs. Swami Bargeshanandaji was an unusual monk and was in-charge of the dairy at the Ramakrishna Vidyashala in Mysore. He was a true Karma Yogi who not only spent a lot time on his early morning meditation but also was a 24 x 7 worker. From construction to dairy to vehicle management – he knew it and did it all. They had more than 50 cows and he was an expert in these matters. While I toyed with the idea of commencing a dairy, I was reminded of our unsuccessful attempt in rearing a cow during our early days at Brahmagiri. After some thought, I felt that it would be worth giving a try. To make sure that we were adequately prepared, we first built the building to house around 16 cows and a few calves. Mallesh, one of our staff was sent to the Vidyashala dairy to acquire the required skills. Only after preparing ourselves for 3-4 months, we decided on going ahead with buying the cows. Buying cows was an adventure in itself. Swami Bargeshanandaji took me along to Ooty, a place that was famous for hybrid cows. We stayed at the Ramakrishna Ashram in Ooty and would venture out each day into the estates, over the hills and into the valleys in search of cows that would suit our location. Swamiji was an expert in identifying these cows and a master negotiator. We would meet middlemen, owners and others and wrangle for hours over the price. Each day would result in finalizing the purchase of 1 or 2 cows. It was a tiring but a great learning exercise. After 4 days of doing this, we had managed to mop up around 7 cows that met Swamiji’s approval. We had to then find a transporter who would bring these cows to Hosahalli. This was also arranged and Mallesh accompanied the cows in the truck that arrived at Hosahalli after 3 days. This school dairy that began in 1993 slowly expanded and had more than 15 cows at its peak. We not only produced enough milk and curds for our requirement but also had some to sell locally. School holidays were challenging times as we had a large quantity of milk to dispose off. Swami Bargeshanandaji suggested that we make milk khova out of this and sell it to shops making sweets and savouries in Mysore. We did this too for a few years. Managing the health of the cows was possible because of the steadfast support we received from Swami Bargeshanandaji and Dr Kaveriappa, a veterinarian who worked in the Insurance Dept. 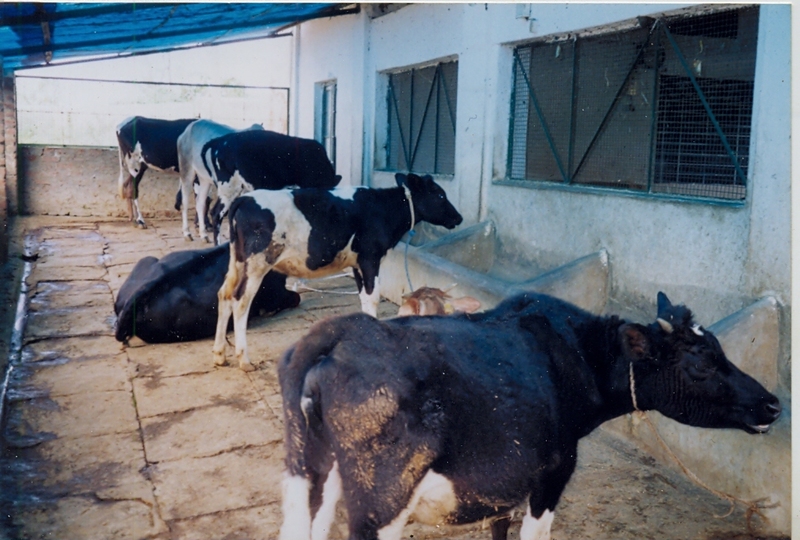 Prasad, the then Resource Manager at Hosahalli was also very devoted to the dairy and was the main reason for its success. We were also not bereft of our share of problems. The cows would fall sick; they needed to be inseminated and vaccinated at the right times; they needed the attention of Vets, etc. All this took a toll on the system and we soon realized that running a dairy was possibly more difficult than running the school. The economics also did not seem right. Buying milk from the KMF Mysore Dairy seemed cheaper than getting it from ours. The efforts of managing the dairy was also leaving everyone fatigued and the interest was beginning to wane. It was then that we decided on gradually shutting it down. We started to sell the cows and by 2005 had completely shut the dairy down. Today, all that remains are memories and the converted building in the Hosahalli campus.